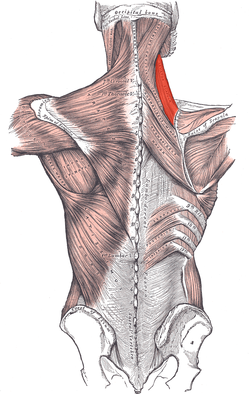 Levator scapulae shown in red. The levator scapulae arises by four slips from the transverse processes of the upper four cervical vertebrae. The slips unite to form an elongated muscle which extends downwards and backwards to be inserted into the medial border of the scapula from the upper angle to the spine. The muscle is cleft lengthwise into two parts; and the uppermost fibers of origin are the lowest at the insertion. The nerve supply is derived from the third and fourth cervical nerves, and also from the nerve to the rhomboids. The muscle assists in elevation and rotation of the scapula and helps to fix and steady it in active movements of the upper limb.